Welcome to the Surface Features thread. Lots to discuss in here. The Barnacle forest is a place I definitely must see some day! There's a bug or something with scanning the Thargoid Scout - but it's possible to do it upside down. Just to note, I mistook this one for a Thargoid scout hatching from structure. Coming closer, it seems to be a "normal" link. Has anybody tried feeding a Thargoid Interceptor heart into the machine in the unknown structures? Even better, overlay it over Thargoid surface site. It does have that appearance, doesn't it? Think it'll grow into one? I suspect something about organs clinic. I know for sure there is a connection, I am missing one step. Currently on my way to Mother of All Barnacles. I took this image at alien structure site. Looks similar to some Thargoid scout parts. The designation 'Thargoid Scout' and presence of Mycoid does kinda suggest that this is a ship from the '84 days. Especially when we consider the 'Scouting Party' comment from Michael Brookes way back when. Question I haven't been able to find an answer to yet: how was the barnacle forest found? Was there a clue leading to the planet, or did people just exhaustively scour the system the Gnosis was jumping to? 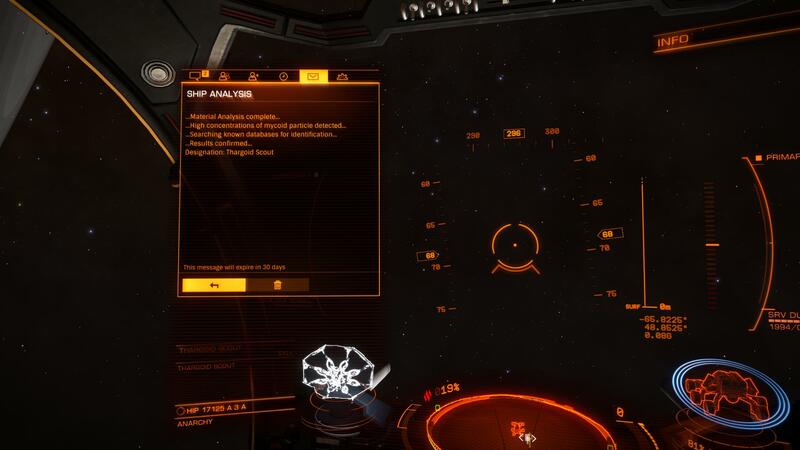 Something like activating the thargoid device, or maybe an uplink, at the surface site on a different planet in the system revealed the barnie forest location. Mycoid? I was at the scout twice last night and didn't see any mycoid. Just the crashed ship and a few thargoid cargo canisters. On the other hand, the canisters of thargoid bits suggest it's recent. There's some sort of damage on it which doesn't appear to match any weapon we've seen so far. Does barnacle forest provide materials for scooping? Is it much more than normal barnacle? Do research limpets work on it? Edit: The first screenshot in his post shows the full scan result.